anti-oxidants and plant sterols to feed, nourish and protect the skin. Our amazing formulation does everything our customers told us they were looking for in a face oil. 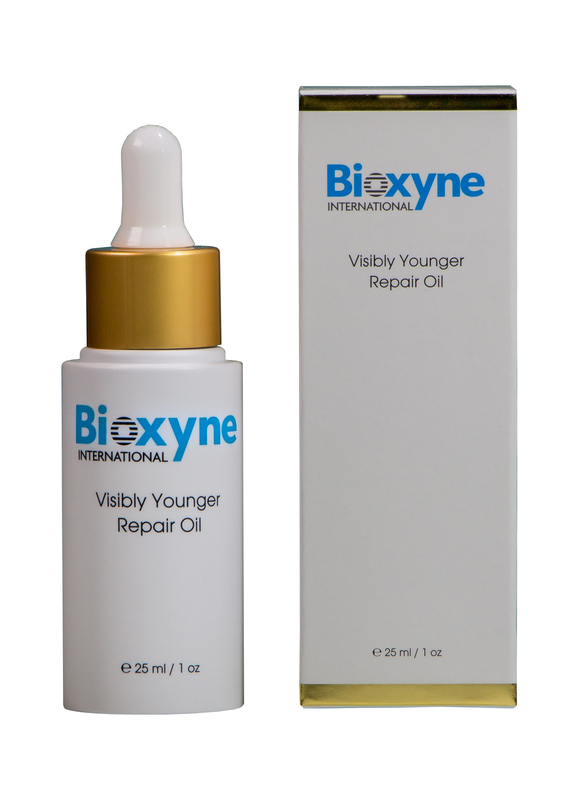 Bioxyne Visibly Younger Repair Oil is easily absorbed, is a true moisturiser as it controls water balance in the skin, as well as it strengthens the skin barrier by caring for the skins basement membrane and connective collagen tissues which improves skin tone, elasticity and texture. Our scientists and product formulators focused on creating a beautiful oil-based moisturising system that would support your skin in both the short-term and the long-term. This drove them to investigate further afield. It became obvious early on that a single oil solution was not the answer. The more they investigated the clearer it got to establish what the ‘perfect’ oil needed to achieve and which oils would give our customers both the feel and the results they were expecting. The highly concentrated formula is rich in essential fatty acids, anti-oxidants and plant sterols to feed and protect the skin.. Visibly Younger Repair Oil is very easy and flexible to use. After cleansing, apply a few drops to face and neck area and work gently in by patting skin until oil is absorbed. Prior to application of oil, you may apply your favourite moisturising cream. Work into skin and then apply Visibly Younger Repair Oil. For optimal results apply Bessence, place a face cloth in warm water and then apply face cloth to face and allow the steam and water to infuse into your skin. Allow the skin to dry naturally before applying Visibly Younger Repair Oil. The reality is natural facial oils cannot hydrate the skin but what they can do is deliver constituents such as sterols, flavonoids, essential fatty acids and tocopherols to name a few which all contribute to the health of your skin. As we age, we produce less of the natural oils that help maintain overall skin quality. The use of good quality facial oils will support the body’s natural processes. Everything you submit is encrypted and 100% secure. No credit card information is stored here or with us.